Welcome to another week in the Adventures of Monotangles. Tonight was a great night, as it was my wife’s monthly shamanic journey circle, so I was able to sit on the couch and tangle and listen to the drumming coming from the living room. 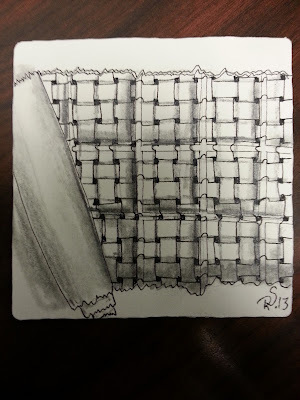 If you have never done Zentangle® to rhythmic drumming I cannot recommend it enough. As both practices lower your mind into a meditative state, it is a double dose of relaxation. The fact that tonight was the circle also reminded me that I really want to start tangling the drum I bought. I think I will start taking it to work with me and work on it on my lunch hours. This week’s adventure is another set tangle. As last week was a curvy organic tangle that was an official tangle without a published step out, this week’s will be the opposite. The tangle for this week it very straight, (curved lines make it a different tangle) and there is a step out, it is even on Tanglepatterns.com. The pattern for this week is W2, the Tanglepatterens page for it is here. 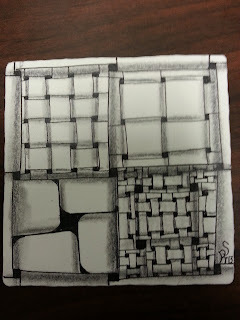 I did two different tiles for this challenge, the 1st I used W2 as a string, then used W2 inside it is different sizes. The second one I used both a ripped open paper effect, and romancy effect under that. Ongoing Monotangle challenge. As a bonus challenge starting this week and going for the next 20 weeks, I am proposing a 20 sided challenge. Below is a link to a template for creating a 20-sided 3D object. I print the pattern out on card stock and trace a triangle on the back side each week. 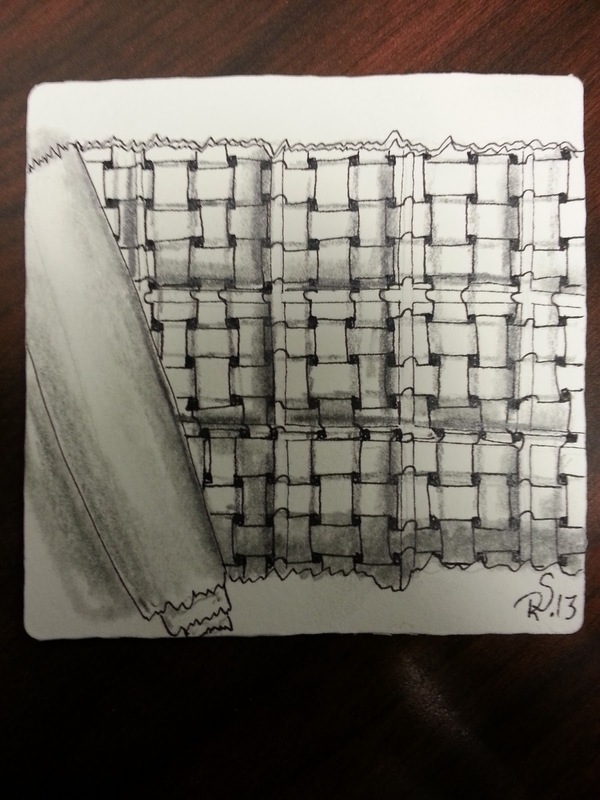 When finished you will be able to fold it up, and roll it to decide on a pattern if you are drawing a blank. When I did this before I taped a penny on the inside of each side to give it weight. 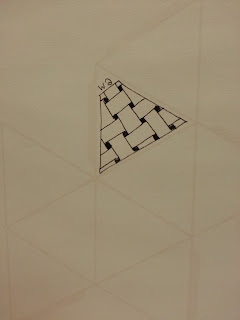 Here is the site for the pattern. I have a page with more detailed instructions here. hihi making our own dice GREAT. Sure thing, I'll do another post with step by step instructions. Will go up tonight or tomorrow. Thanks for asking for this, I am sure it will help others also. Yes, we all need more help with this. I found a 10 sided triangle on your pattern site. How does that translate into a 20 sided? I am working on better instructions, I will add a page to the blog with step by step instructions. I should have it up tomorrow. I also want to point out that the adventure this week is not the 20-sided object. That is a bonus challenge that will continue each ween until it is finished. 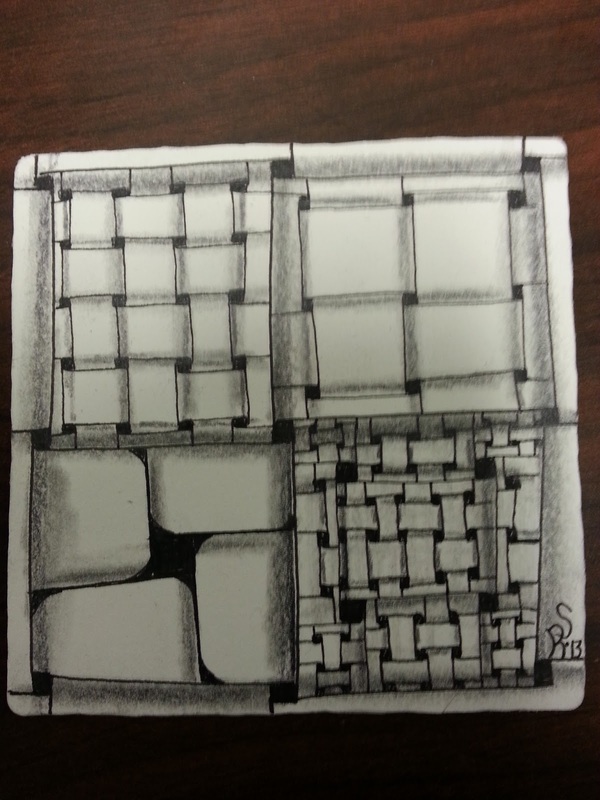 I have never done any Zentangle challenges, but I feel obligated to do this one after all those questions! Thanks for the W2 challenge. What I wanted to do immediately popped into my head. What came out doesn't exactly match, but that is part of the process, too. Okay. I get the 20 sides thing-majiggy...how to print it and how to make it and how to fold it. Ginny, I understand what you are talking about and I highly recommend making more than the one for the ongoing Adventure. A big part of the ongoing adventure, is to see if you can slow down, and add the tangle from each weeks adventure to the 20-sided dice. I love the work you have already posted to your blog! I liked this tangle the more I practiced. I still need to check out the 20 Week challenge, don't know if that will fit into my general living right now. I discovered your challenge through "Tanglebucket" and this is my 1st participation. I hope I'll be able to join regularly as I'm becoming more and more fan of tangle.